As many of my readers may be aware, my mantra since 2010 has been that “We simply don’t have enough qualified home buyers in American, once you take away the cash buyers, to have a real economic recovery in housing “. While some may be tired of this refrain, there remain a number of highly respected housing “gurus” who continue to profess that it is unfairly tight lending standards, not the lack of qualified buyers that are suppressing a housing recovery. The difference is not academic. • They lack adequate monthly income. A lot of the jobs created, post-recession, are low paying jobs that don’t provide adequate income to support a mortgage payment. More liberal lending standards will not correct this. • They lack liquid assets. The down payment (even just 3% for some loans) and closing cost for a home purchase exceeds many American’s available liquid assets. • There is no financial bubble. The formal definition of a financial bubble is an economic cycle characterized by a surge in asset prices above the fundamental value of the asset. The housing bubble created excess demand based on poor lending standards. When the bubble popped, that excess demand disappeared. Not all the demand was fake in that cycle, however. In fact a good portion of it was real. It would be a drastic mistake to attempt to manipulate lending standards in an effort to recreate that extra fake demand. If historically low interest rates cannot generate home ownership demand, then we need to accept that a percentage of our adult population is simply not in a financial position to take on mortgage debt. Still think tight lending is preventing a housing recovery? A quick review of the requirements for some of mortgage loans available may surprise you. No money for a down payment? Is zero down too tight? VA (Veterans Administration) loans require no down payment, a minimum FICO score of 620 and allow up to 60% debt to income ratio. I don’t think anyone could call this tight. Poor credit score? Is a FICO score of 560 too high? FHA (Federal Housing Authority) loans require a FICO score of 560 to 620. (Scores of 650 are considered “fair and below 600 are considered poor or high risk). Other requirements include at least 3.5% down, and a maximum debt to income ratio of 43%. In some cases they will accept up to 50% debt to income ratio. High debt to income ratio? Is 50% debt to income ratio too stringent? GSE (Government Sponsored Enterprise) loans allow for 43% to up to 50% debt to income ratio in geographical areas where housing is particularly expensive. A minimum FICO score of 620 and a 3 % down payment is also required. Other common requirements for these loans are a history of the same line of work for the past 2 years, 4 weeks of consecutive pay stubs to verify income, most recent W2, and most recent 2 months bank statements. Home loans are available and home loans are being made. Over 4 million purchase home loans were given to Americans in 2014 and thankfully those were largely to folks who have the financial capacity to own the debt the home ownership. One of my 2015 housing predictions was that we would see 5%-10% total growth in mortgage purchase applications due to the low bar set last year. 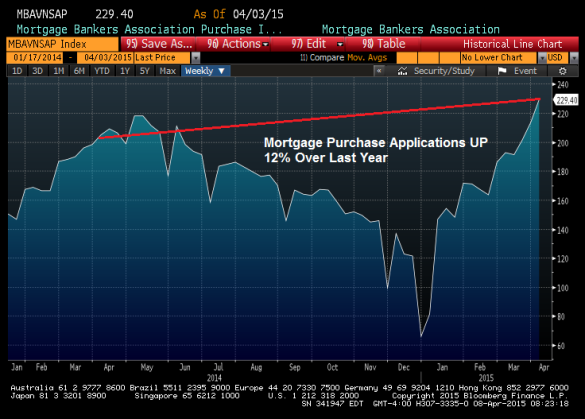 We are now seeing above 5% total growth, year over year, for 2015 mortgage purchase applications. 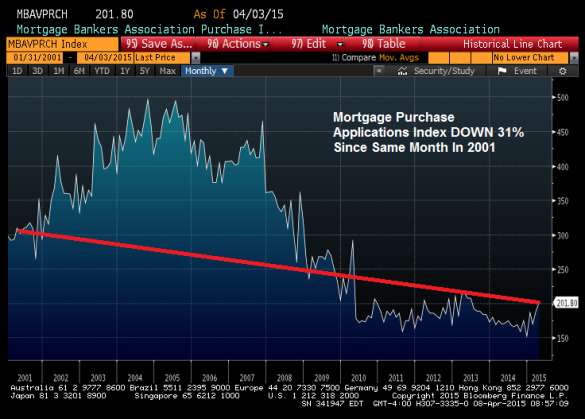 As you can see below, mortgage purchase applications are still well below the pre-housing bubble years. For 2015, I predicted year over year growth in all housing metrics, demand is improving. Having said that, even if cash buyers continue to make up a larger than “normal” percentage of home buyers, total existing home sales will still be soft – so we have a ways to go to get back to a normal healthy market. All housing analysts, I would surmise, would like to see a more robust housing market. Where we disagree is what should be done to encourage a healthy market. I believe we have a moral obligation as a society to reject attempts to engineer conditions that encourage people to put themselves in economic peril. We did that before, it was a disaster and we must learn from our past mistakes. I have to believe that those who are saying lending is too tight are either not aware of the actual requirements and have absolutely no lending experience or have some other agenda that is preventing them from acknowledging the obvious. Gotta wonder. Frankly, I also gotta wonder why we keep listening to them. Posted in Uncategorized and tagged Debt-to-income, DIana Olick, Down payment, FHA, FIco Score, GSE, Home purchase, Laurie Goodman, Mortgage Purchase Applications, Tight Lending, VA. Bookmark the permalink. Spot on as usual Logan! As an appraiser since 1979 and publisher of “The South County Home Price News” @ HouseReferee.com, I can support every word in this outstanding post. 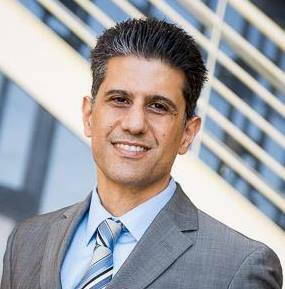 My clients and readers should consider Mr. Mohtashami as the most authoritative expert in the Real Estate industry today. “I believe we have a moral obligation as a society to reject attempts to engineer conditions that encourage people to put themselves in economic peril. We did that before, it was a disaster and we must learn from our past mistakes.” – Couldn’t put it any better. My question is, Logan, other than the traditional methods (calling/writing to your congressman, etc., how do we as a society reject these engineering attempts? Lowering the bar to homeownership had such disastrous results but up until the crash there were plenty that benefitted enormously from the lowering of the bar (real estate agents, builders, mortgage/lenders, etc.). To keep from going down that road again, I would think that it would have to be the industry players in particular that would have to be the loudest voice in rejecting the bar being lowered again. You seem to be the exception as I think most industry folks are fairly short-sighted and would welcome the flood of new business again even if it would ultimately lead to the same disastrous results. Or, has society largely learned from the recent past mistakes, and, even if the bar is lowered again, people won’t bite as easily this time around? 85% plus of all loans go through government agencies, so the U.S. government is really calling the shots here even with QM put into place. Now, the point I always try to make with the tight lending group is what else are you asking for? You have low fico, low-payment, high debt to income ratio loans in America. Mark Zandi’s & Laurie Goodman’s of the world … if you ask them what would they change about lending standards, they will never give an answer. At this point all you can do is bring back 0% down loans and stated income loans for wage earners. It’s almost too simple for them to see. I think that is the problem. We all have the same data to look at. What I call economic bubble cities. Main street America gets this thesis I am saying.